If you read the fortunes in fortune cookies and say, “I can do better than this!”—your opportunity is here. But instead of hiding in cookie fortunes, your thoughts can be immortalized on tea bag tags. Good Earth Tea’s tea tags have long featured inspirational quotes. The company has just launched the “TAG, YOU’RE IT!” Tea Tag Contest to allow tea drinkers the chance to share their own words of wisdom. tea bag tags could inspire others. 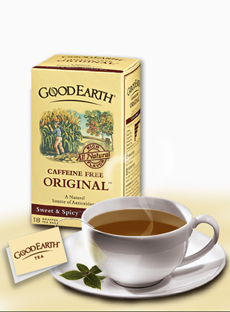 Winners will also receive copies of their tea tags and two boxes of Good Earth Tea. Entrants can submit as many original quotes as they wish. Email your entry to teatag@GoodEarthTeas.com, post at www.Facebook.com/GoodEarthTea or tweeting to @GoodEarthTea. For more information and complete rules, visit GoodEarthTeas.com. You can also request a $1.00 coupon. Find more tea inspiration in our Gourmet Tea section. Brush up on your tea terminology in our Tea Glossary.